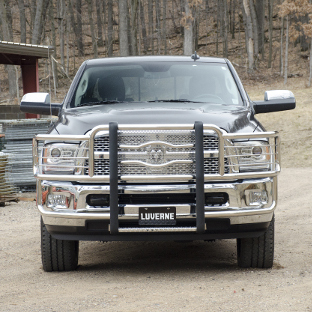 The LUVERNE Prowler Max™ is a heavy-duty grille guard for trucks that work hard. 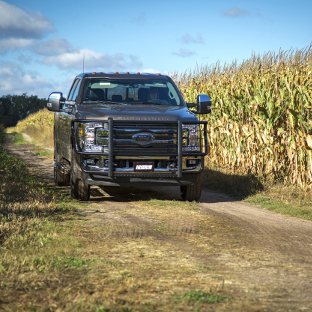 Everything about it is engineered to provide professional-grade front-end protection, while adding a sharp, stylish look to your truck. The Prowler Max™ grille guard is designed for vehicle-specific application for a custom fit with no drilling required. It has a one-piece design for maximum strength and is available in two finish options. 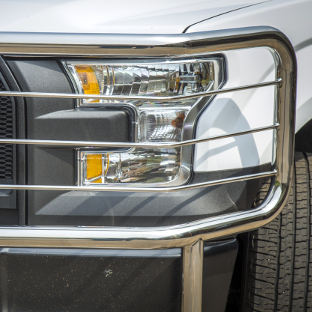 The Prowler Max™ truck grille guard is engineered to work hard, offering superior protection for the front end and a stylish, integrated look. It is also compatible with an optional winch mount. 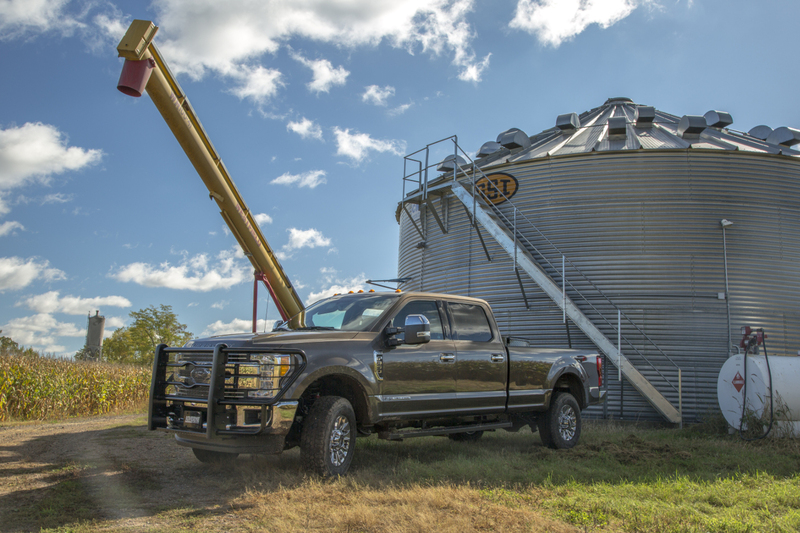 Each Prowler Max™ grille guard is uniquely designed for a specific truck application, installing with no drilling required and providing a fully integrated look for maximum front-end strength and rigidity. 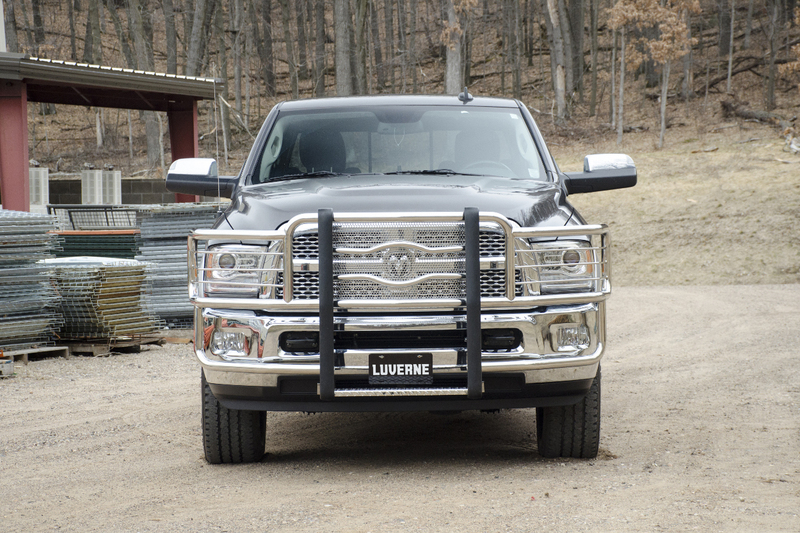 The Prowler Max™ grille guard for trucks is equipped for hard roads and challenging jobs. Built into the center section is a punched steel screen constructed from heavy-gauge steel. This screen serves as a barrier to keep gravel, sticks and road debris from damaging your grille, while maintaining consistent airflow to the engine compartment. The Prowler Max™ is also equipped with heavy-duty wraparound brush guards, featuring a double-stack design to protect both the bumper and headlights. The brush guards are set with 3/8" steel wires for additional headlight protection. 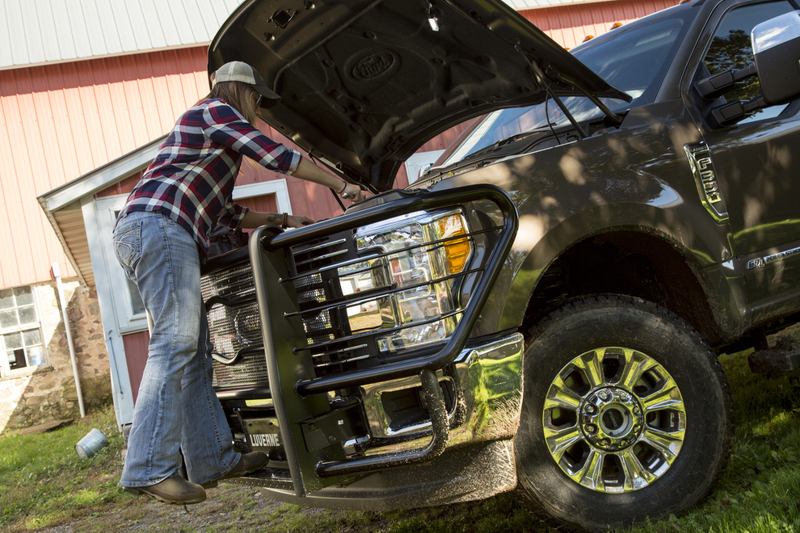 For maximum functionality on your full-size, lifted work truck, the Prowler Max™ comes with an integrated step. The bottom cross-member of the one-piece grille guard is a 4" wide diamond-plate stepping surface. 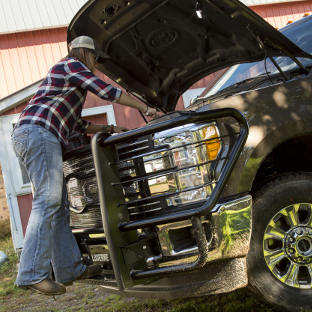 The step offers a handy leg up on the front-end of the truck, making it much easier to access the engine compartment. 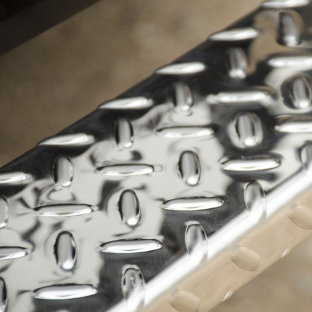 This is a must-have for full-size work trucks, especially when working under the hood, and the diamond-plate finish provides extra non-skid traction. 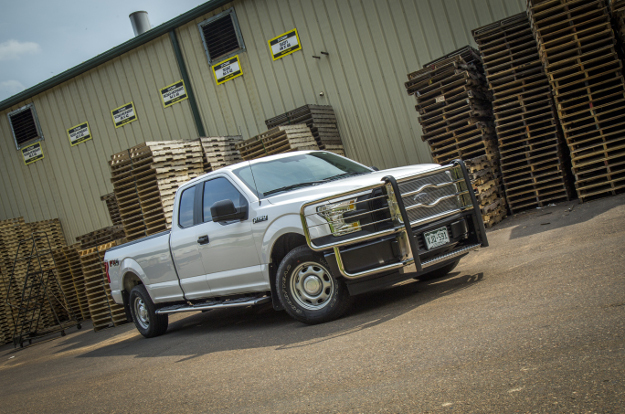 To optimize the Prowler Max™ grille guard for work trucks, we construct it with a one-piece design. 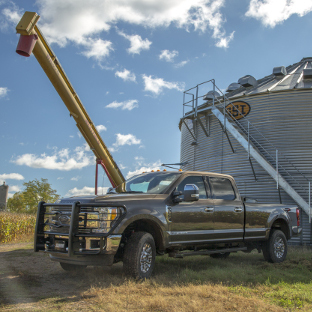 The vertical uprights, center tubes, mesh screen and 2" tubular side brush guards are all welded together, maximizing the grille guard's strength and ensuring the best possible front-end protection. 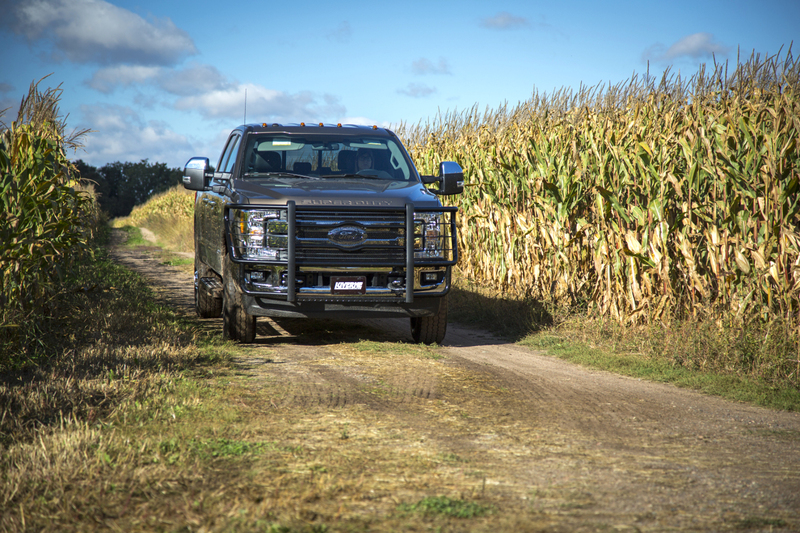 We also design each grille guard model to bolt onto the truck's frame, enhancing its front-end strength and greatly reducing any vibrations while driving. 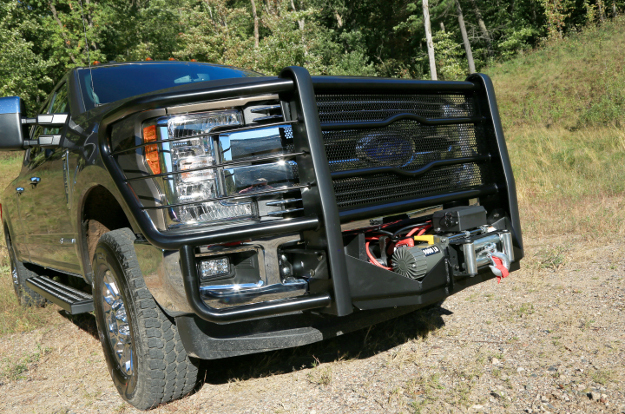 All Prowler Max™ truck grille guards come with powder-coated steel brackets for a complete installation and dependable front-end strength. 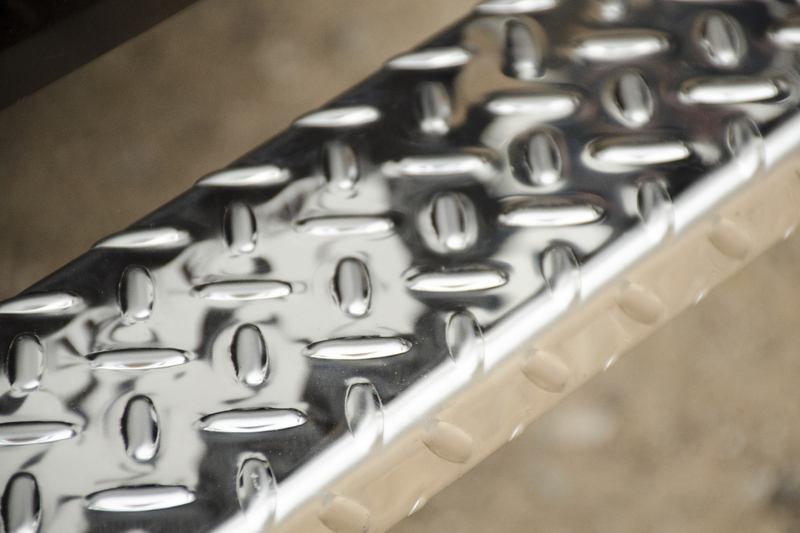 The signature touch on every Prowler Max™ grille guards is the center vehicle logo reveal. The horizontal tubes contour around the truck's emblem, showing off your badge in a unique way. The contoured steel tubes are also welded into place on the one-piece frame to further enhance protection for the truck grille. Whether you're a one-man operation or you're managing an entire fleet, the Prowler Max™ grille guard allows you to give your business a professional front. Select from two finish options to find the look and functionality that will best serves your needs. Both finish options come with protective rubber facings along the vertical uprights. The carbon steel grille guard is a high-strength option and features a dual finish for maximum UV, chip and corrosion resistance: E-coat and black powder coat. 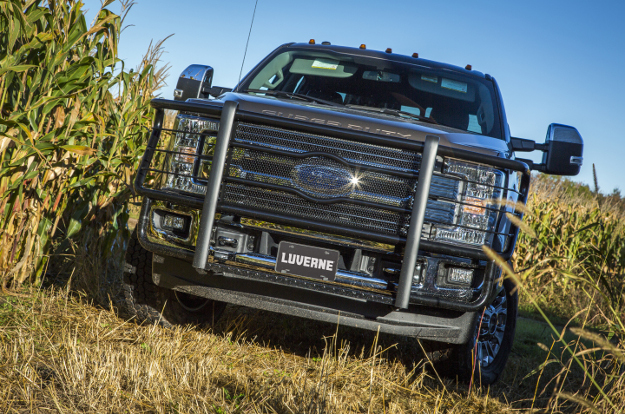 The stainless steel grille guard is made with 201 stainless steel for exceptional rust resistance. It has a highly polished finish for a bright shine. 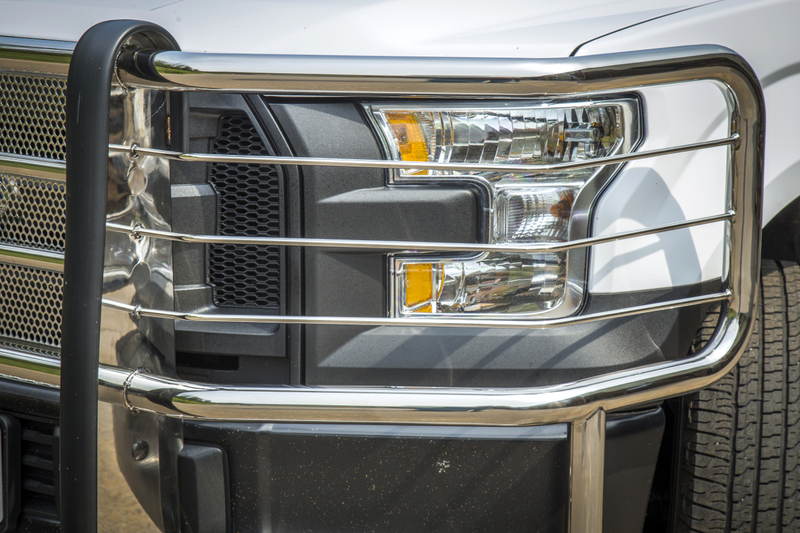 Perfectly suited for your business and your truck, each Prowler Max™ grille guard is engineered with a vehicle-specific design. 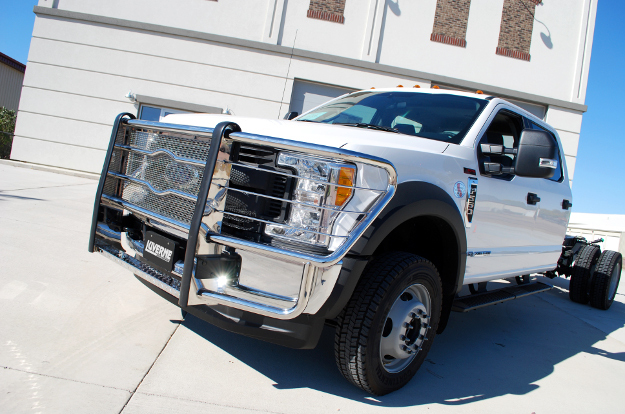 It seamlessly integrates with the truck's front end, utilizing pre-existing mounting points for no drilling required. The Prowler Max™ offers a custom fit without any of the fuss. The brackets, brush guards, uprights and even the logo reveal are all tailored for a unique application on each model. For greater functionality on your work truck or offroad pickup, we offer a Prowler Max™ winch mounting platform for select applications. 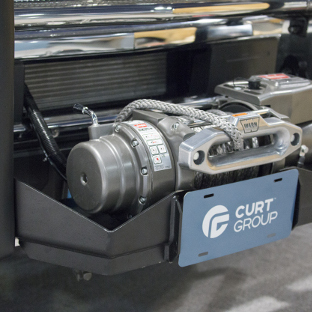 Each winch mount is made vehicle-specific and is tested for a straight-line pull of up to 16,500 lbs. This makes it well-suited for any number of offroad work applications or recovery towing jobs. 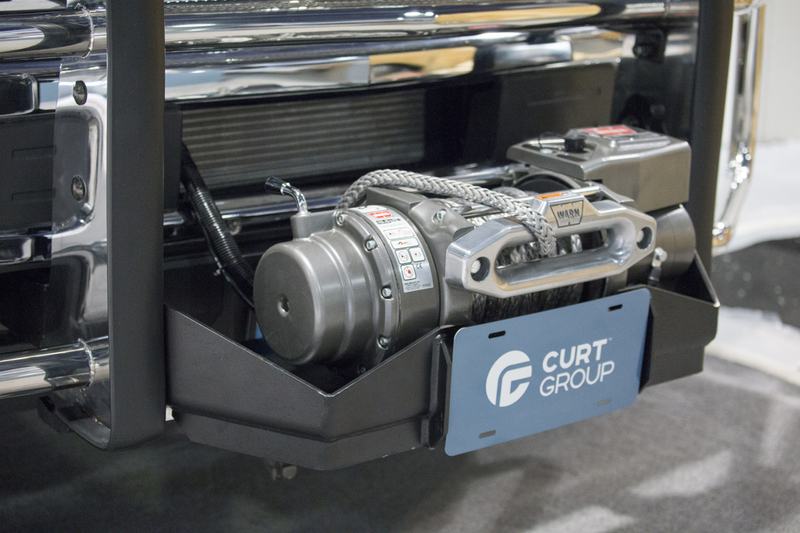 The winch platform accepts a wide variety of winches, featuring standard, slotted winch mounting holes. 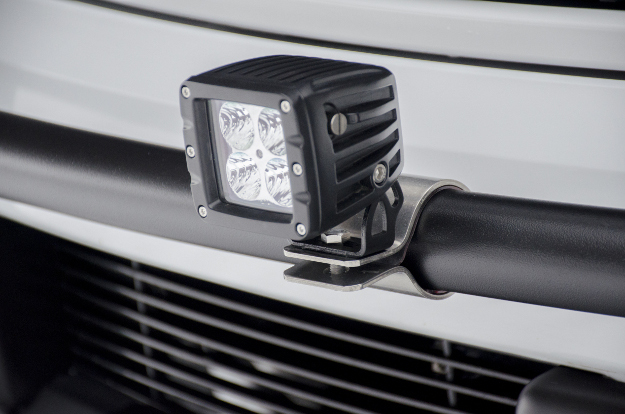 Give yourself increased capability and safety in the field by adding LED lights to your work truck. The 2" diameter tubing of the Prowler Max™ grille guard readily accepts our 2" light mounting tabs #390100. The stainless steel tabs will fit any 2" diameter tube and easily bolt onto the Prowler Max™ using the LED light hardware. They're perfect for adding square LED work lights and giving your truck better visibility and more functionality when working late into the evening. For LED work lights and light bars, visit our fellow truck accessories brand ARIES.